You have to see for yourself what the Maytronics Dolphin DC Series Robotic Pool Cleaner is capable of! Juliano’s Pools & Spas carries the latest in pool cleaning technology! 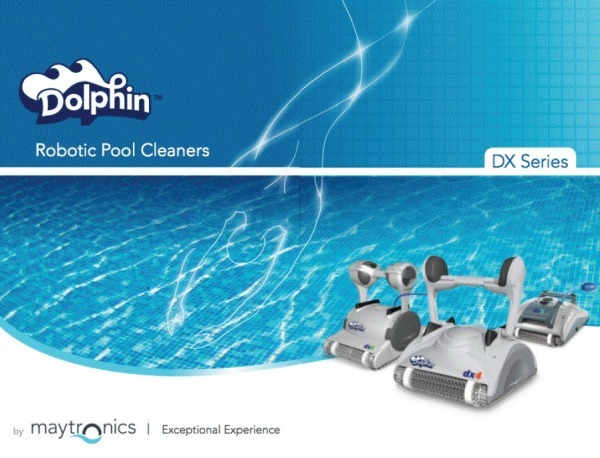 Maytronics Dolphin DX Series Robotic Pool Cleaners will leave your pool sparkling clean after every use. To ensure thorough cleaning, your Dolphin cleaner is equipped with built in software that systematically cleans your entire pool regardless of your pool’s shape or surface. Dolphin’s patented swivel cables eliminate tangled cables forever! As your Dolphin moves around the pool, its swivel ensures that the cable stays free and clear, allowing for complete pool coverage. Preset cleaning cycles throughout the week with the push of a button! Your Dolphin can automatically clean every 24 hours, 48 hours, or 72 hours for 3 consecutive cycles. Your Dolphin will let you know when it’s not operating at peak performance due to a clogged filter. When the full bag indicator light comes on, you know it’s time to clean the filter. For touch-guided navigation and cycle options. Call Juliano's Pools today at (860) 870-1085 or (413) 525-7665 to learn more about our robotic pool cleaners.